We are engaged in wholesaling, trading and supplying a vast array of Water Pressure Pumps. These products are designed for maintaining pressurized water flow at the outlets while consuming minimum energy. Our range is available in three variants and is supplied with pressure switch and tank. 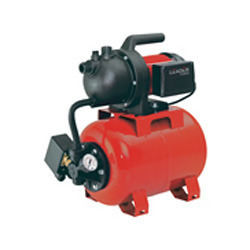 The features of the pumps include laser welded Norel PVC pump components, anti corrosive pump motor components, auto on and off, in built thermal overload protector and space saving design.